I thought I would write an article on how to buy lottery tickets and to make payments using a LotteryNetwork enabled websites. Visit the website: PlayEuroMillionsOnline.com how else you gonna buy tickets? 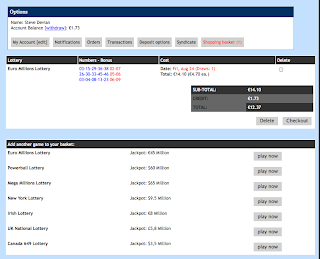 Pick the lottery game you wish to play by clicking the "play now" button beneath the relevant game, I personally like playing Euromillions and this is why I have chosen the EuroMillions site and the Euro Millions game. Once you have clicked the play button, the page will re-load with the game you wish to play loaded into the ticket selection box. Enter your numbers and continue. This elements displays the results of the last two games. If you like you can use the link provided to view the prize breakdown and winners. This section outlines the next jackpot size, time till we shut down accepting tickets, and an opportunity to Like the game on Facebook. If the Jackpot is not showing, it may means the official lottery has not updated the new jackpot to their site or our cron has malfunctioned and is waiting for a manual update. 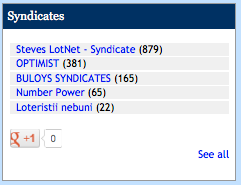 This little box outlines the top 5 syndicates. We also have a Google Plus link so that you can add the page to your Google circle. Select day of week: If you purchase a ticket for a number of draws you can opt for your ticket to be entered in ALL the draws, i.e Tue / Fri or specific draws such for instance, only Tue draws. Start date: This is the draw date that you wish to enter your first ticket into, it may be in two weeks time. How many tickets: Select how many tickets you wish to purchase. 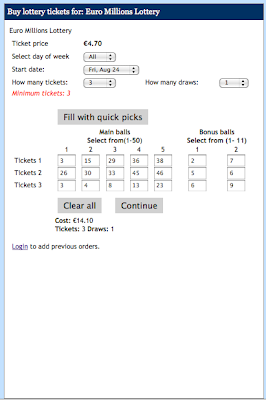 How many draws: Select how many consecutive draws you would like your tickets to be entered into. Note this works in conjunction with the "Select day of week" option so if you enter your ticket into 10 draws, and you have opted for the Tue draw, it will then be entered into all consecutive Tuesday draws. Fill with quick picks: This generates random quick pick numbers and fills the board for you. 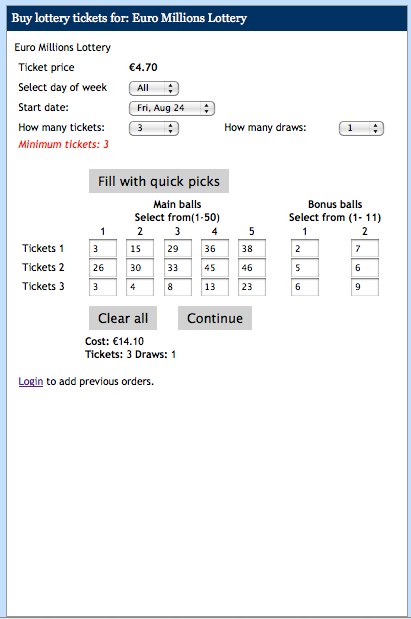 You will notice that the cost of your purchase will be displayed below the form as well as how many tickets you have purchased and for how many draws. If you are logged into your account, you will have an option to duplicate previous purchases. If you are not registered or logged in, you will be asked to do so. Please follow the onscreen instructions. Your chosen tickets will be displayed as well as the price of the purchase. If you have credits in your account, these willin whole or in part be deducted from the total price depending on the final amount as our minimum payment via our paytment gateways is €10.00. 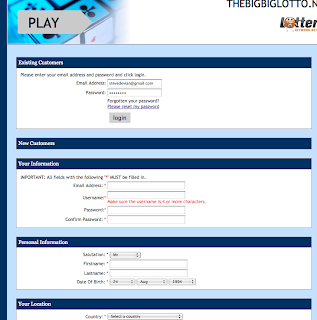 You will also be able to add further tickets to your draw by clicking on the other games available. NOTE: You can not add the same game twice, this will cause an error. Do note that it may take a few seconds to re-direct you which will depend on your internet connection speed. You are now on our payment pages. 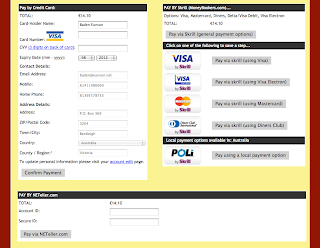 The first payment option is by Visa. If you have a Visa card, enter the details and complete your payment. 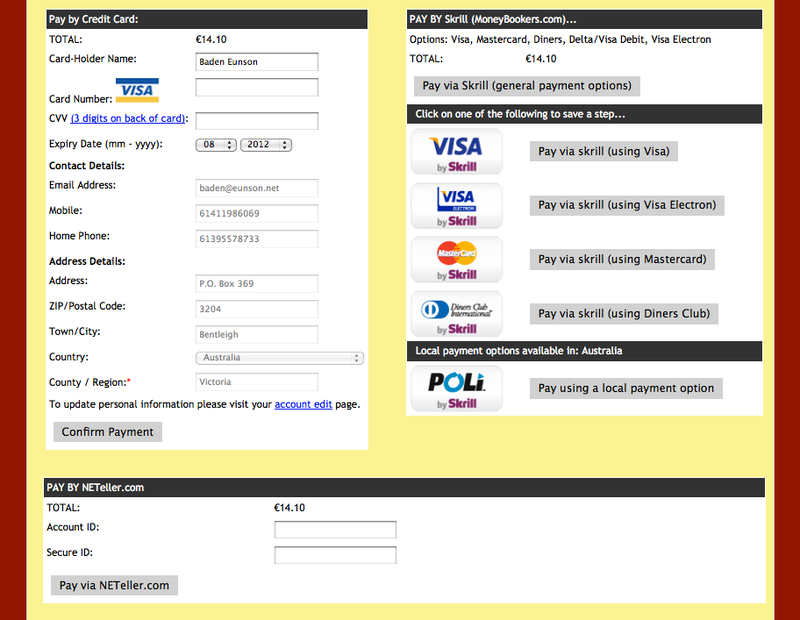 If you have a MasterCard or a Visa card you can use MoneyBookers / Skrill to make your payment. this is oure preferred payment option. The last option available is via NETeller which you need to stroll down to find. 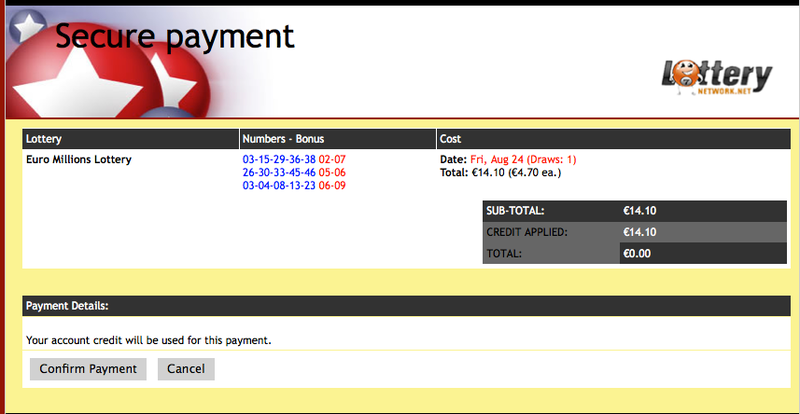 On the payment complete page you will have your order outlined. At this point we have sent you your order confirmation email as well. Please make sure you check for this, if you have not received it, check your spam filter. 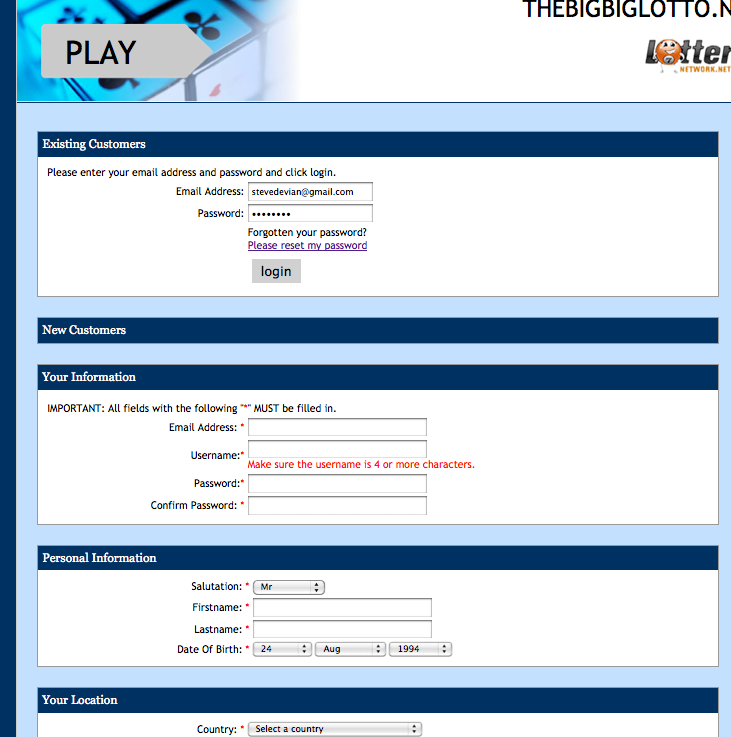 You may need to whitelist our domain with your ISP, if so, please whitelist all email from lotterynetwork.net. 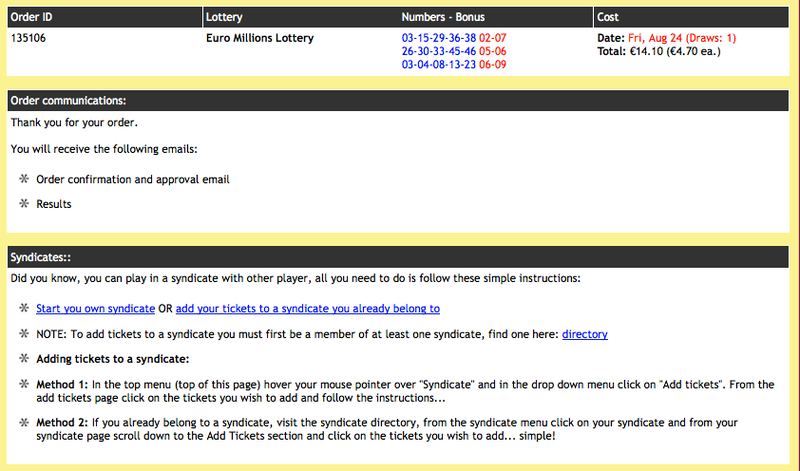 From this page you can navigate to the syndicate pages where you can add your tickets to a syndication. NOTE: You may be asked to log back into your account at this point in time as your session on the partner domain may have expired. 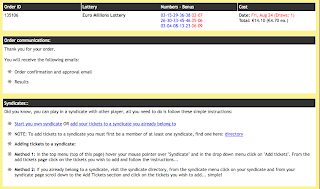 If so re-log in and add your tickets to the syndicate pages. Only hours left to win €190 million Euromillions bucks! Euromillions is at a record high of €190 million and there are only a few hours left for punters from around the world to get in on the action! Anywhere else would be risking your cash and your jackpot if you won! Lottery Affiliate Program - Start earning money today! With the Euromillions and Powerball jackpots at over €190 Million Euro's and $212 Million USD's respectively, people all over the world are securing their tickets for a chance to become incredibly rich. Some smart people out there are also taking the opportunity to make money selling these tickets via a lottery affiliate program. But what are good products to sell? In general this will depend on the market you are able to reach. If you have a blog about cars, chances are you would do well selling auto related bits and pieces. If your website offered financial advice or legal services, again you would do well selling some kind of related service. Where do I find good products to promote? There are plenty of places to find products to promote, probably the most popular is clickbank. Lottery Harvester is a way to increase your odds of winning the lottery! From the publisher: "This software has everything, large pool of numbers, great guarantees and a huge chance of winning lotteries without breaking the bank as far as buying lottery tickets is concerned and is a must for anyone serious about winning the lottery for the minimum outlay." 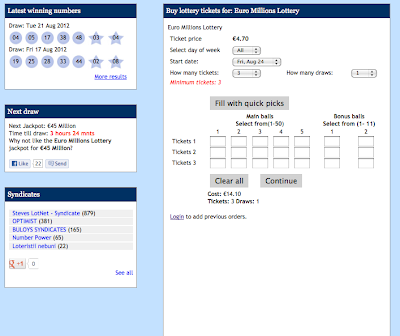 Here is another site selling a lottery software app to help you increase your chances of winning the lottery. How about promoting the lottery? If you wish to earn money like I am by promoting various products, you can promote the lottery by signing up to our lottery affiliate program. 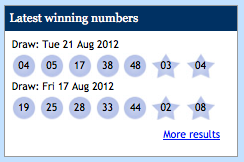 The results are out for the Euromillions lottery for Friday the 3rd August and it is an official ROLLOVER! The Euromillions jackpot has rolled over again! 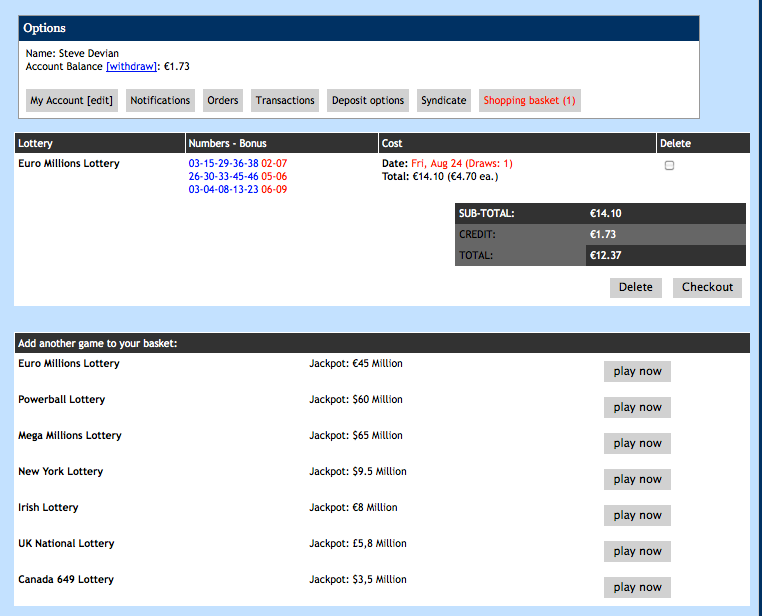 Next jackpot is a whopping: €175 Million EURO!